On June 20, the Secretary of State's Office will park its Mobile Driver Services Facility van in front of St. Bernard Hospital and Health Care Center, 326 W. 64th St., from 10 a.m. to 2 p.m.
ENGLEWOOD — Eric Hood has been without a valid state identification card for two years. In June, the Englewood resident will have a chance to obtain a new one without leaving his South Side community. On June 20, the Secretary of State's Office will park its Mobile Driver Services Facility van in front of St. Bernard Hospital and Health Care Center, 326 W. 64th St., from 10 a.m. to 2 p.m. so Hood and anyone else can renew or receive a driver's license or state identification card. "Now all I need is to come up with the money to get a state ID," said Hood, 47. "I lost my driver's license in 2000 for a DUI and have not been able to get to the Secretary of State's office to get an ID." Derek Michaels, a spokesman for St. Bernard Hospital, said it partnered with the Secretary of State's Office to bring this service to Englewood to help both senior citizens and residents such as Hood. "There are five senior buildings within a block from the hospital, and many [seniors] have mobility problems and [are] unable to go to the Secretary of State's Office," Michaels said. "One of our biggest problems is people [over age 18] who come to the hospital requesting medical records but do not have proper ID." Michaels said he would like to make the event an annual one. "Depending on how things go, I would like to do this again next year and every year after that," Michaels said. "Our purpose for making this happen is because we saw there was a need for this service." 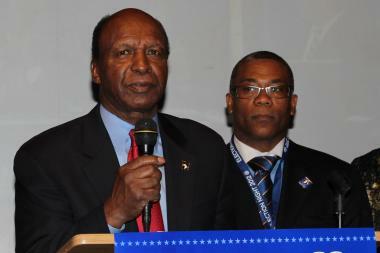 Secretary of State Jesse White said it has been a priority of his to treat the public as efficiently and as courteously as possible. “The mobile unit is an important part of the Secretary of State’s Office and I am delighted that we are able to bring these important services to the Englewood community,” White said in an email. “This [mobile service] is a great example of how my office can work with public and private institutions to make these transactions more convenient." The regular cost for a driver's license is $30, and a state ID is $20. State IDs are free to those 65 and older, said Dave Druker, a spokesman for White's office. Druker said applicants renewing a driver’s license or state ID card should bring their current driver’s licenses or ID cards. To receive a duplicate or corrected driver’s license or ID card, an applicant should bring two forms of identification, such as a utility bill, a photo ID and a valid birth certificate or passport.